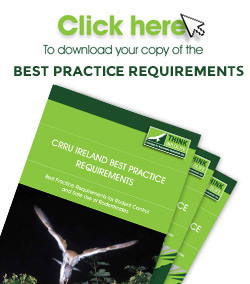 CRRU Ireland and IASIS, have updated the “Wildlife Aware” training course, and associated accreditation scheme, for professional pest control technicians and other competent users of rodenticides. The course and accreditation are aimed at those who offer a service of rodent pest management to farming enterprises and other businesses in rural areas or to manufacturing and business premises, offices, hospitals, sports facilities and other premises in semi-urban and urban areas. Those who attend the course will have already attended training courses in rodent pest management so that they are competent in the use of anticoagulant rodenticides. IASIS offers “Wildlife Aware” accreditation to all those who attend the “Wildlife Aware” course and pass the examination. This accreditation is intended to indicate to customers for rodent pest control services that those who hold the accreditation will work to the highest standards in order to achieve effective pest control with minimum adverse effects on wildlife and the wider environment. The accreditation is offered to the individual (not their companies) and follows the technician wherever they work. Accredited technicians are permitted to use the “Wildlife Aware” logo as a symbol of their special competence. Those interested in attending “Wildlife Aware” courses can obtain details of forthcoming courses in Ireland by contacting IASIS via its website (www.iasis.ie). All “Wildlife Aware” trainers are IASIS registered. Provides a review of the problems caused by rodents to the economy. Particular emphasis is given to diseases carried by rodents and to the quest for quality within accreditation schemes driving an increased requirement for rodenticide use. Important rodent pest recognition characteristics and behaviour relevant to implementing effective control are described. Draws attention to the types of rodenticides available for use. 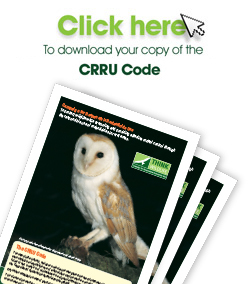 Highlights the range of wildlife, pets and farm stock that may be affected by rodenticides. Provides an understanding of the statutory incident investigation arrangements in place to track the impact of poisons on raptor species. Draws attention to and describes the many non-target rodent and other mammalian species at risk from exposure to rodenticides. Provides an insight to the diet of raptor species and to the distribution of their populations. Describes primary and secondary routes of wildlife exposure to rodenticides, highlights the adverse effects of rodenticides and the distribution of rodenticide residues among key wildlife species. Explains the fundamentals of rodent control using an Integrated Pest Management (IPM) approach and the effective and safe use of rodenticides. Provides an outline of the processes involved, and explains the Principles of Integrated Pest Management (IPM) in rodent pest management. Highlights the legal obligation to abide by product label instructions as well the legal obligation to comply with Best Practice Requirements. Outlines the restricted circumstances in which continuous toxic baiting programmes are permitted and the conditions that must be respected where a pulsed baiting technique is used. Describes the steps to be taken once infestations are eliminated, including the collection and disposal of dead rodents, the removal of uneaten bait as well as required proofing, sanitation and hygiene measures. Explains the objectives of the CRRU initiative, the important risk mitigation measures required to reduce wildlife contamination (CRRU Code) and the potential benefits of each of the measures recommended.